December was hectic beyond our expectations. We learned a lot about what to expect this year for the holidays and the energy was high. Every week resulted in new records set and new lessons about how much inventory the little store could go through. The Saturday before Christmas we ran out of sampler bottles and there were some disappointed last-minute shoppers looking for stocking-stuffers. All told though, we managed to put smiles on so many faces as the hours and days flew by. This month should afford us time to catch our breath and look ahead to our second year. We have our first Northern Hemisphere Extra Virgin Olive Oils and are kicking off the season in style. The Arbosan from California is creamy and mild with artichoke tones and just a hint of green apple. On January 19th, NH Chronicle re–aired our episode from February of last year. What a difference! Seeing the store before the expansion reminded us of how far we’ve grown. The excitement of it being just two months old brought back memories and the sudden explosion of ideas and growth was fun to revisit. 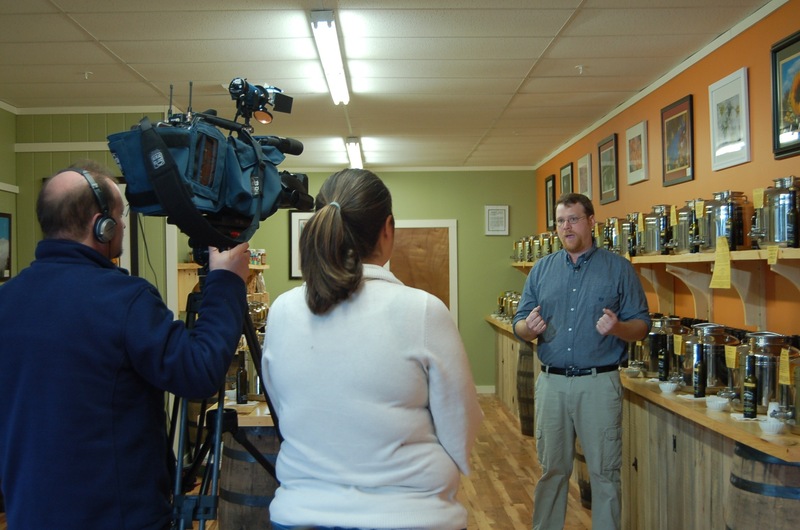 On Thursday, the 22nd, Monadnock Table Magazine sent a reporter and photographer to do a feature on the store. 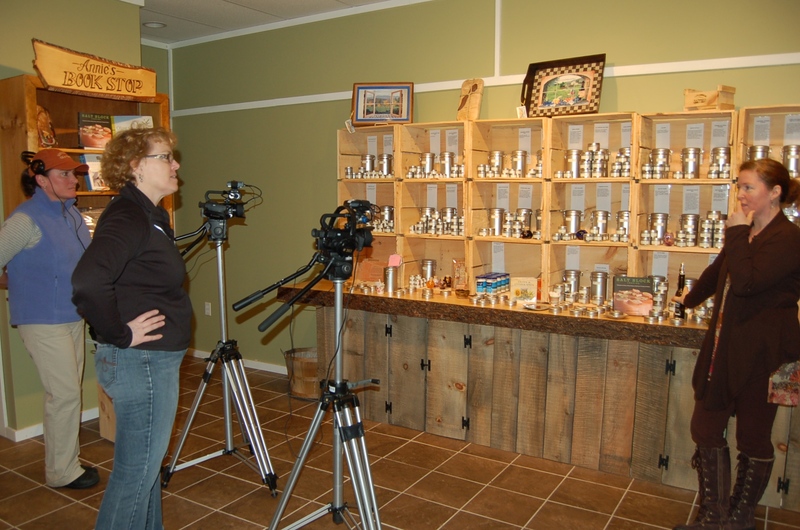 We wanted to show the accession of the mission statement from simply healthy oils and vinegars to a unique tasting showroom. Melissa from Attar Herbs and Spices stopped by to discuss the Herb and Salt bar and Benjamin Meijer, our German Cheese maker arrived with a cooler full of custom cheese. Coincidentally, Chef Joe showed up to prep for the cooking demo later in the week and added to the interview. Korey’s an old hand at interviews now! 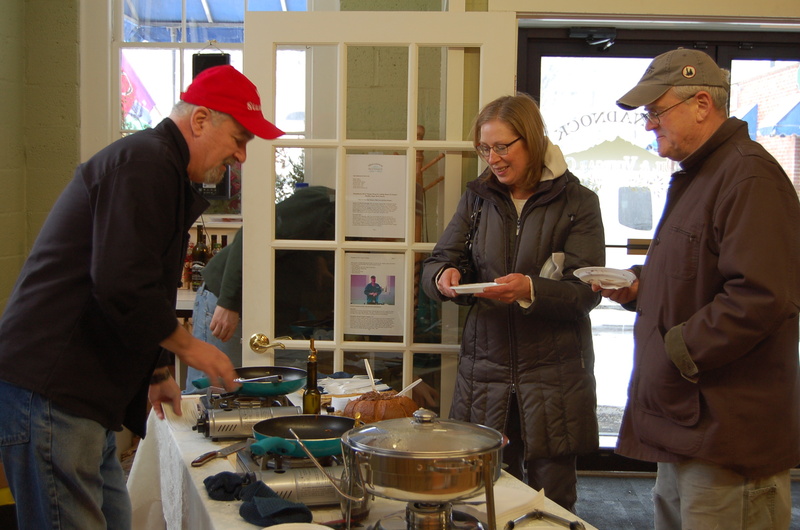 Our monthly cooking demo series took a break in December but we came back in style on January 24th with our old friend Chef Joe serving up some healthy Super Bowl Snacks. It was a varied menu; Toasty Walnuts, Black Bean Dip, Fruit quesadillas, Salmon Roll-ups, Pistachio Stuffed Mushrooms and Maple Glazed Pork Tenderloin Medallions. It has been a year of total immersion into cooking and good health. Our customers have brought ideas and support allowing us to constantly hear, “This is my new favorite store!” every day. What a wild ride! This entry was posted in Cooking, memoir. 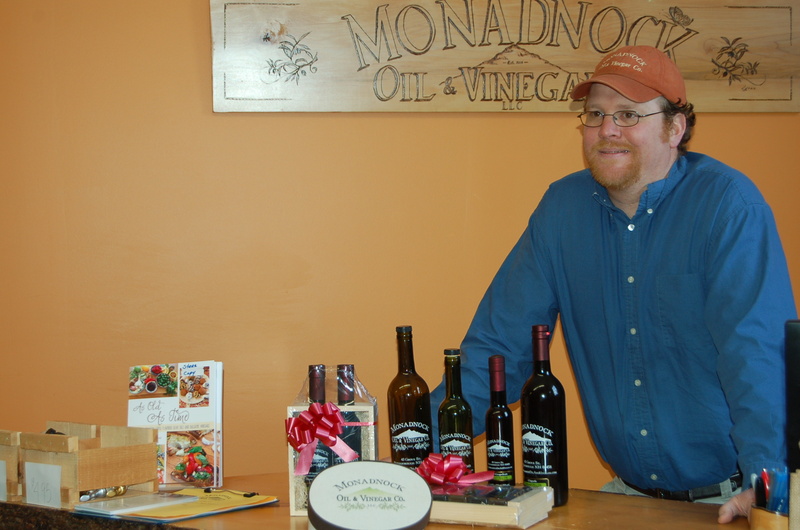 Tagged Attar Herbs and Spices, blogging, cooking, Cooking Demo, Imagine That Honey, Monadnock Oil and Vinegar, Monadnock Table Magazine, NH Channel 9, NH Chronicle, oil and vinegar, retail sales. Sounds wonderful. How exciting for you to be part of all of this! It’s all so fascinating, thank you for sharing it and glad you’re over the worst! I saw that Chronicle rerun with you filling the bottles. I’m glad you’re feeling better. Two of my sisters either have or have had the flu. Thanks Marie, so much change in a year!